Two members of the 2018 CASFS Apprenticeship course have received Future Organic Farmer grants from the California Certified Organic Farmers (CCOF) Foundation. Makshya Tolbert is a member of the 2018 CASFS Apprenticeship course, a six-month intensive trainign program. 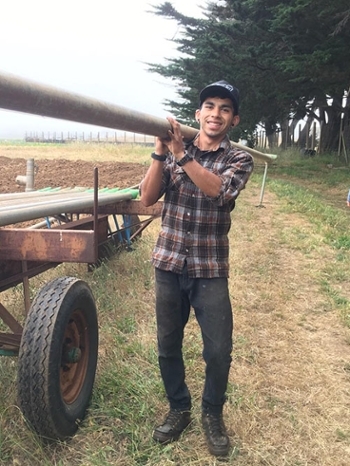 David Robles helps manage the UCSC Farm and serves as an assistant instructor for the 2018 Apprenticeship program. Makshya Tolbert and David Robles, participants in UC Santa Cruz’s 2018 Apprenticeship in Ecological Horticulture training program, have received Future Organic Farmer grants from the California Certified Organic Farmers Foundation. Offered to students in higher education and vocational programs in organic agriculture, the competitive grants provide help with tuition and other educational expenses. 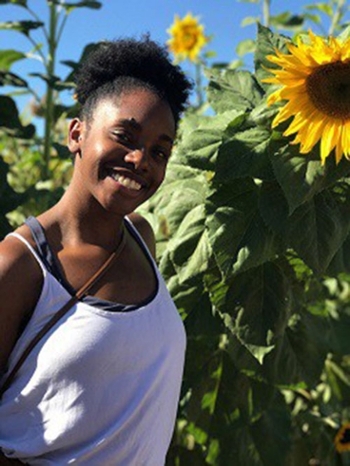 Tolbert is part of the six-month training program in organic farming and gardening at the UCSC Farm & Garden, coordinated by the Center for Agroecology & Sustainable Food Systems (CASFS). Robles, a 2017 Apprenticeship graduate, is continuing his training and serving as an assistant instructor in this year’s Apprenticeship program as he helps run the UCSC Farm’s hand-worked gardens. She notes that as she began learning to grow food on campus farms and gardens. “I felt empowered to write about my experiences. I was eager to fill the gap of women of color farmers, striving to reassert our multidimensional roles across the environment,” says Tolbert. “Farming has taught me to love working with my hands. What began with organic farming at Stanford has evolved into seeing myself as a cook and potter who feels most empowered when my hands are wedging, blending, kneading, and carving.” Following graduation, Makshya will be part of the Agroecology Fellows cohort for 2018-19, continuing her learning at the UCSC Farm & Garden, and serving as an assistant instructor for the 2019 Apprenticeship class. Robles, who earned his undergraduate degree at UCSC in the History of the Americas, started working at the UCSC Farm as an undergraduate and became a student farm manager, as well as working with students from the FoodWhat?! youth empowerment program. He sees youth as critical to changing the food system and hopes to model that change for them. The CCOF Foundation offers grants through the Future Organic Farmer Fund in three categories: Kindergarden through eight grade teachers, high school students, and higher education and vocational students pursuing degrees or certificates in organic agriculture. to help with tuition and educational expenses. To qualify for Vocational and Higher Education grants, applicants must be enrolled in an educational program in the United States that will benefit their career in organic agriculture, including vocational training/certificate programs, junior college/two-year degree programs, and bachelor’s/four-year undergraduate degrees. Learn more at the Future Organic Farmer Grant Fund link.